Suddenly we are in a frenzy to find a good deal on a pair of kayaks. How did we get to this? Mme. Ross and I said last autumn that it would be cool to try kayaking together this year, to take on the swift Missouri River in a pair of plastic boats with a single paddle apiece, and only a life jacket to ensure our safety. Mme. Ross was also hooked. After we pulled back in at the beach she asked to try out a kayak, and we paddled back out, I on a board and her in a green kayak. Now we’re looking to make water sports our “thing” this Summer, and in years to come. The equipment will likely pay for itself versus the rental fees, and it just so happens that we have a spare car we will gladly sell to help finance this adventure. It’s almost like the Universe wants us to do it. Are you having your Summer adventures yet? I’d love to hear about them in the comments . . .
now get out there and explore. Btw …. cool photo – which I’m still trying to figure out – the fluff foreground vs. the horizon ….. care to explain? I took it upside down while laying on the ground but my dingus phone knows which way is up, so I had to flip over the photo anyway. 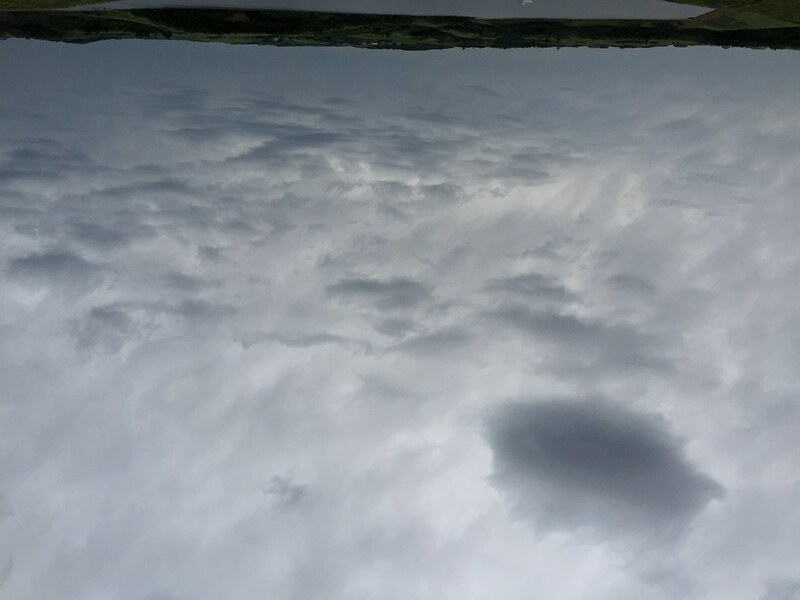 That photo is what I intended to take, and I took one of just the sky, and it was remarkable to me how I could tell it was upside down just from how the clouds looked. Sounds like great fun! I tried a canoe once, it was OK, but I’m not a fan of deep water, as certainly no fan of the barrel rolls, is that what they call them? Like when you go over and all the way around? Or the waves they refer to as “barrels”? Did you do it on a fast-flowing river? Eh, a calm lake in controlled circumstances lol I’m a wouss!